Solid, chic and masterfully made; the Bar Accessories collection from Teak Warehouse will put the finishing touch on your outdoor furniture setting. From gorgeous breakfast trays to a fully operational bar unit; our Grade A Teak Bar Accessories are the addition you need to make outdoor dining a breeze. 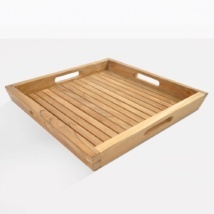 Teak Warehouse offers a spectacular mix of teak bar accessories perfect for any outdoor space. Our outdoor bars, patio bar carts and bar accessories are long-lasting and made for outdoor environments. Set up your porch for intimate dining with a café table and two arm chairs, and then enjoy serving up charming breakfasts on our Small Square Teak Serving Tray. Big on the BBQ? 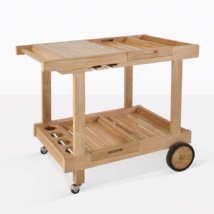 Why not purchase a Teak Bar Cart to get the ribs, sausages and corn from the heat straight to your guests? Perhaps you love throwing a party. 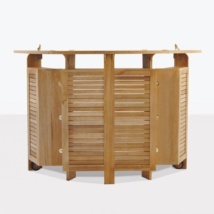 Designate a bartender then set up the beautiful Toscana Teak Outdoor Bar, easily movable with a fold-in design, in the centre of your space for cocktails, mocktails and more! 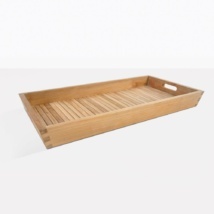 All of our high quality bar accessories are made from A Grade Teak, which ensures that you are getting the best of the best for your great outdoors. A Grade Teak is the choice when you want beautiful look, and a long lasting material. Full of natural rubbers and oils, A Grade Teak is proven to be a stronger, hardier wood, perfect for use the unpredictable outdoors. With a fashion forward approach to design, Teak Warehouse’s gorgeous and unique bar furniture and accessories are sold at wholesale prices. Visit our showroom which is open 7 days a week from 10:00am – 6:00pm or call us TOLL FREE AT (800) 343-7707 and our experienced bar furniture design staff can assist in creating the perfect outdoor bar for your needs. We arrange quotes, delivery and care information. Call now!